By nature, options are a depreciating asset. Just as a new car buyer will find that the value of their purchase diminishes once the automobile is driven off of the seller’s lot, an option buyer will find that the time value of their long option erodes with every passing minute. Nonetheless, traders continue to be lured into long commodity option strategies. This is likely due to the fact that purchasing an option provides traders with unlimited profit potential and the risk is limited to the premium paid. The peril in this type of approach, as mentioned before, lies in the fact that although one’s losses are limited it is likely that an option buyer will lose some or all of the value of the option. Selling call options is a bearish strategy. Unlike buyers of call options, sellers believe that the market will decline in the opposite direction of the strike price or at least be below the stated strike price at the time of execution. I am of the opinion that options on futures sellers should initiate positions on a day in which the market is going against the soon to be position. Doing so may translate into a higher premium collection and accordingly create a scenario in which there is more room for error in terms of the futures price relative to the short call strike price. For example, Call options should only be sold during times of elevated market prices and relatively inflated volatility. 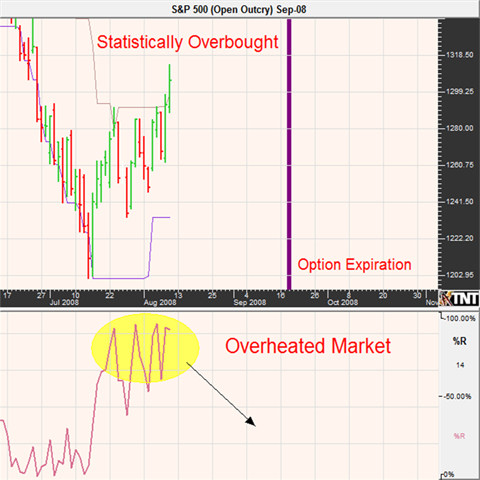 This could mean that the market is approaching the top of a trading range, or simply overbought. While doing so seems somewhat irrational, it can be justified in the fact that the premium collected will be greater as well as the odds of a correction. 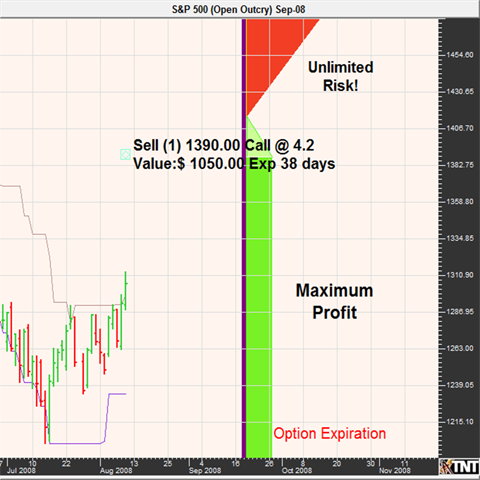 Why Sell Call Options on Futures? What is the Risk of a Short Call Option? This particular trade creates a scenario in which there is a great deal of risk, in fact unlimited risk, above the RBE of the short option. In this case, the RBE is 1394.2 and was calculated by adding the premium collected to the strike price of the short call option. Keep in mind that transaction costs would reduce the amount of premium collected and shift the RBE and risk closer to the market. The amount of premium collected represents the cushion, or the amount in which the trader can be wrong in their speculation that the futures price will be below the strike price at expiration before the trade results in a loss. The maximum profit is equivalent to the premium collected ($4.2 or $1,050) minus any commissions and fees paid and occurs if the futures price is trading below 1390 at expiration. However, the profit zone of this trade, or where this trades money at expiration, is impressive. This is visually displayed in Figure 2. Assuming that this short option is held until expiration and it was possible to sell the 1390 call for $4.20 ($1,050 for a full sized contract or $210 for a mini) in premium, it would be profitable with the price of the futures market at any point below the RBE of 1394.2 before considering transaction costs. In other words, the only way for this position to be a loser at expiration is for the futures price to be above the RBE. It is important to note that although the position is still profitable in between the strike price of the short call and the RBE, the amount of the profit diminishes every tick that the market is trading above the strike price. Once the market surpasses the strike price, it is equivalent to being short a commodity futures contract and exposes the trader to theoretically unlimited risk. It is easy to see that a short options on futures strategy, if implemented effectively, can provide traders with an edge over the alternative. In this particular example, the futures price was over 80 full handles away from the strike price of the short call. The distance from the market and the amount of premium collected provides the position with plenty of room for error. After all, I am not perfect and I assume that you aren't either. What you should also know is that without proper risk management knowledge and instinct, what looks to be a great strategy can turn into disaster. This is due to the fact that option selling involves unlimited risk and limited profit potential. It is imperative that short option positions are monitored closely, additionally if you aren't ready for the responsibility and risk involved you should be working with a full service broker familiar with short option trading. Although more options than not expire worthless putting the odds in your favor with short option trading doesn't produce automatic success. It is critical that risk on the losing trades is properly mitigated before the damage gets out of hand. This is where an experienced broker may come in handy.